Built in a traditional design with a fresh twist, this casual arm chair will make your home complete. 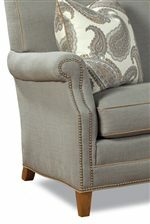 Beautifully detailed nailhead trim outlines the set-back rolled arms and base for a sophisticated touch. Ultra plush seat cushions and padded attached back combine for maximum comfort and support. A high-quality hardwood frame and tapered wood feet ensure long-lasting durability and support. Pair with the matching stationary sofa for the complete elegant living room look. Available in a variety of upholstery options. The 7436 Casual Elegant Chair with Nailhead Trim by Huntington House at Wayside Furniture in the Akron, Cleveland, Canton, Medina, Youngstown, Ohio area. Product availability may vary. Contact us for the most current availability on this product. Fabric Options This collection is available in a variety of upholstery options. Fabric and leather patterns are measured and marked by hand to insure accuracy. Fabrics and leathers are individually cut by hand with great attention to detail and quality standards. Our cutting and sewing departments follow strict guidelines to assure the highest standards in fabric matching and high-end upholstery tailoring. Padding & Ergonomics The Ultra Plush cushion, standard on many styles, features a thick polyurethane core wrapped in layers of ultra soft Dacron fiber (to provide a softer seat) and then sewn into a ticking. Traditional detailing combined with a clean, modern structure gives this upholstered living room collection a fresh, sophisticated feel. 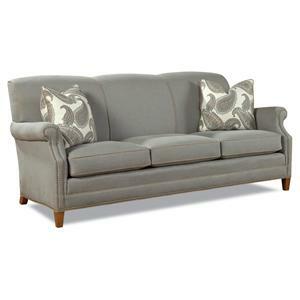 Beautifully crafted nailhead trim outlines set-back rolled arms and base for an elegant touch. Tight back and ultra plush seat cushions combine to bring you the ideal comfort level seating. The stationary sofa also comes with two accent pillows for a modern splash of color. Crafted with a high-quality hardwood frame and tapered wood feet, this collection promises long-lasting support for years to come. The 7436 collection is a great option if you are looking for Casual furniture in the Akron, Cleveland, Canton, Medina, Youngstown, Ohio area. Browse other items in the 7436 collection from Wayside Furniture in the Akron, Cleveland, Canton, Medina, Youngstown, Ohio area.